Usually the actors that allow you to switch power on/off and who measure power usage use the 434Mhz or 868Mhz wireless bands to communicate with their base station. 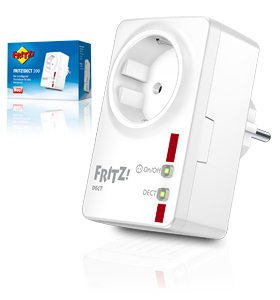 Now the german manufacturer AVM came up with a solution that allows you to switch on/off (with an actual button on the device itself and wireless!) and to measure the power consumption of the devices connected to it.